Kurukshetra University For Clerk Govt Job 2019 Syllabus Check Here. Kurukshetra University Notification is out. Kurukshetra University is recruiting for 198 Clerk Govt Job Posts. You can check Kurukshetra University - Kurukshetra University last date, download Kurukshetra University notification, visit Kurukshetra University official website and check other Kurukshetra University Vacancy details.Complete Vacancy and recruitment Details about 198 Clerk Govt Job vacancies in Kurukshetra University are provided below by JobSarkari.Com only for you. Last Date of Apply Online. 15/05/2019 Up to 11: 59 P.M.
Last Date of Pay Fee. 15/05/2019 Up to 11:59 P.M.
PH of Haryana. No Fee. Mode of Payment. Candidate Can Pay Fee Through Online Mode. Candidate Must Have Passed Graduation And Having Class 10th With Hindi Or Sanskrit As one of the Subject. Having Class 12th/ BA/ MA With Hindi As on of the Subjects And Having Typing Speed 30 WPM in English As Mentioned in Notification. 1. Type Test (Phrase I). 2. Computer Appreciation And Application Test (Phrase II). 3. Aptitude Test (Phrase III). 4. Academic Qualification (Phrase IV). 2. Candidate Can Click on the Apply Online Link As Given on our Website in Important links Section. 9 Online Applications Can be Submitted on or Before 15th May 2019. Q. What is the Last Date For Kurukshetra University Clerk Govt Job Vacancy ? A. 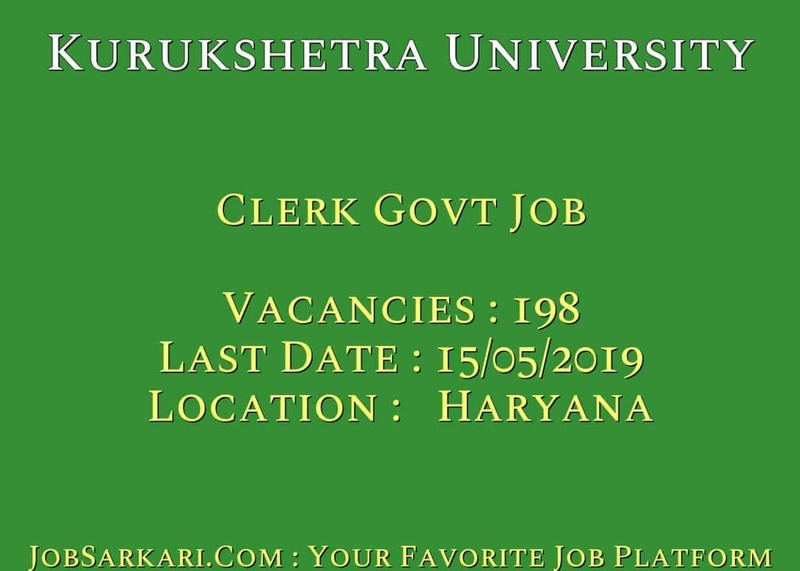 Last Date for Kurukshetra University Clerk Govt Job Posts is 15/05/2019. Q. What is the Form Type of Kurukshetra University Clerk Govt Job Recruitment ? A. The Form Type for Kurukshetra University Clerk Govt Job Posts is Online. Q. 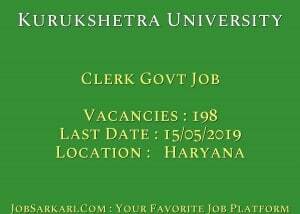 How many vacancies are available in Kurukshetra University Clerk Govt Job Posts ? A. There are about 200 Vacancies in Kurukshetra University Clerk Govt Job Posts. Q. What is the Full Form of Kurukshetra University ? A. Full Form of Kurukshetra University is Kurukshetra University .